It sure looks that way when the sell-off is examined for signals on the economy. Friday's decline was led by cyclical industries, among them banks -- casualties of a flattening yield curve that many would attribute to the Federal Reserve chairman. But it's drawing steam from a host of other sectors whose profits are directly tied to the economy. "The real underlying catalyst is the question investors are struggling with: how much of a slowdown are we looking at?" said Jim Paulsen, chief investment strategist at the Leuthold Group. "Is it a full-fledged recession or a period of very sluggish growth and route to some recovery down the road? That's really what's driving the markets today." 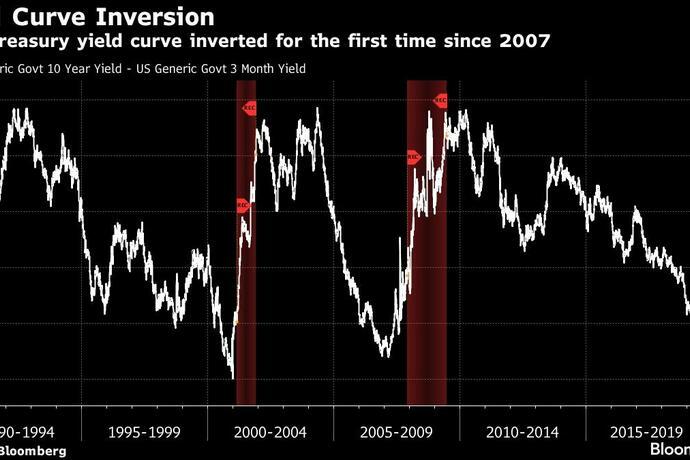 The Fed's preferred yield curve inversion measure turned negative Friday for the first time since 2007, a sign that preceded past recessions. The flip came after a slew of economic data showed economies slowing around the world. Japan reported a contraction in its manufacturing sector, and Europe's economic outlook was thrown into fresh doubt after reports showed weakness in Germany and France. A few minutes before inversion, the preliminary U.S. Manufacturing Purchasing Managers' Index printed a 21-month low, according to IHS Markit, with manufacturing companies indicating weak business conditions. Manufacturing output, new orders and employment all softened this month, the data show. 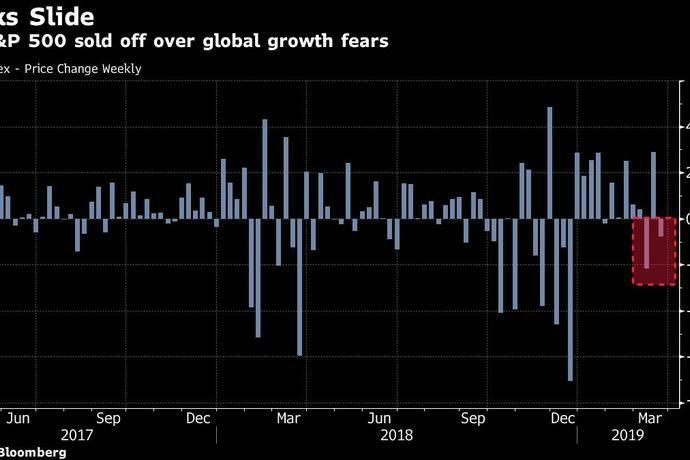 "It's a great indicator of a global slowdown and nervousness about your economy in general," Joe "JJ" Kinahan, the chief market strategist at TD Ameritrade, said by phone. "It's the cautionary orange sign on the highway right now." Smaller stocks took a beating. Before today, chart watchers were looking to the Russell 2000, hoping it would confirm the rest of the equity market's rally. 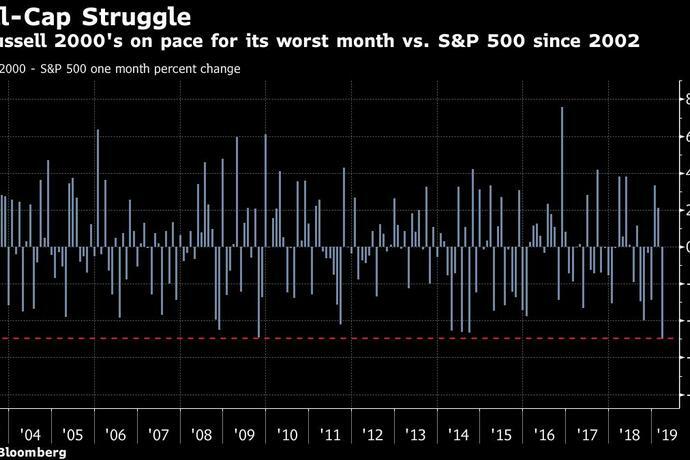 Instead, the small cap gauge experienced its worst day since early December, and is on its way to the worst month of underperformance relative to the S&P 500 since 2002. While banks make up a quarter of the index and are bearing the brunt of the pain, eight of the index's nine industries -- including cyclical materials and consumer discretionary -- are down in March. "It's just another one of those many signs of there's a lot of risk in the market," said Jerry Braakman, chief investment officer of First American Trust, in Santa Ana, California, which manages around $1.5 billion. "They tend to under-perform when the economy starts to do worse and they're more sensitive to it." Markets certainly haven't made Powell's job easy since he took the helm. He was vilified for communications blunders in the fourth quarter stock meltdown. It was an easy case to make, given losses mounted after Powell hinted rates were a long way from neutral. And once the views were walked back, it was off to the races for stocks. With equities mostly down since Wednesday's uber-dovish pronouncements, it may be that the Fed's potency in markets is wavering. The Cboe Volatility Index, commonly seen as a barometer of fear in the market, spiked the most since early December. "The Fed's an easy target," said Paulsen. "They are a reactive animal. They take their orders from their boss and that's the economy. Their boss tells them what to do. Why waste so much time parsing every little thing they say because if the economy changes they'll change what they say. So why not pay attention to that?"